The extremely popular BCM Footy Tipping Competition has been run and won for another year. Our competition has now been running for 18 consecutive years and become one of the most popular and longest running tipping competitions within the Road Profiling Industry. Choosing winners in both the NRL and AFL fixtures over the entire season makes this a unique challenge and an opportunity for the Footy Tragic or a Footy Novice to come away winners at the end of the season. 39 tipsters of all ages competed this year for the glory of being the Champion Tipper and getting their name on the Shield, not to mention the substantial prize money on offer for 1st, 2nd and 3rd places, and of course the dreaded Wooden Spoon for the lowest place tipper is what we all tried to avoid. This season Jemma Gore and Daniel Berry tied for 2nd place with a total of 254 correct tips, a great effort from Jemma in her 1st year and Daniel a past winner in 2014 remains Mr Consistent at collecting a top 3 place. The Wooden Spoon Shield this year goes to Adrian Pye. Adrian finished in last place with the entire weight of the ladder on his shoulders with a total score of 200. Better luck next year Adrian and maybe take another look at those algorithms you used to pick the winners. But the loudest applause is reserved for this year’s winner. In his 3rd attempt and the 1st year where he hasn’t been in the running for the Wooden Spoon, Nathaniel Kenyon a Gold Coast Suns supporter gets his name permanently engraved on the prestigious BCM Tipping Competition Winners Shield with a total score of 256 correct tips. This year is the last year that Steve Gawley will be running the competition, Steve has decided the time has come for him to hand over the reigns of his beloved Tipping Competition to Jemma Gore. On behalf of all tippers past and present I would like to thank Steve for the way he has returned the competition back to its former glory after it fell into a lean period a few years back. So, thanks everyone for taking part, it has been a great year and remember only 7 months until we do it all over again. 15 Years of Loyal Service. October celebrates not only Oktoberfest but more importantly here at Base Course Management, October 2016 celebrates the 15th year of service of Terry Pearce. Since 2001 Terry has been operating our milling machines, his expertise accumulated over the years is second to none in our organisation. A lot of changes have occurred during Terry’s time at BCM from the original W1000 Rear Loading Machines through to the most recent W100CF, Terry has operated them all. We have had logo changes, machinery changes, address changes and even management changes, and Terry is still here serving Base Course Management as our longest serving and very loyal operator. On behalf of management and staff at BCM, congratulations Terry. Well another footy season is over ladies and gents and that means the results are in and final for the Annual BCM Footy Tipping Competition. This year we have a first time winner, Julie Berry. Julie won all on her own with a total score of 281. Well done Julie, finally you get your name on the trophy. Second place was a tie between Adam Berry and Lloyd Twogood, with a score of 279. So this year all the prizes go to NSW, come on Qld you may win the State of Origin every year but you need to pick up your act in the all important tipping comp. I would also like to offer a special thanks to Steve Gawley, who this year returned the competition to its former glory by running a very well organised and professionally run competition with his off-sider Brooke Montgomery chipping in while Steve was on leave. So that’s it folks another year complete, only 6 months until the footy starts all over again……..I for one cant wait. Go Pie’s and Go Qld in 2017. After 6.5 years at BCM Qld Linda Lacey has decided that the city life is no longer for her. Linda and her husband Mark are on the move and heading down to the NSW North Coast to enjoy the relaxed beach lifestyle. Half your luck guys. Thank you Linda for your dedication and loyal service over the last 6 years and on behalf of all the Base Course team I would like to wish you and Mark all the very best. Greg Thomson celebrates 5 years with BCMQ. This month BCMQ celebrated Greg Thomson’s 5 year anniversary with us. Greg started at BCMQ as a bobcat operator and quickly applied his skills to operating and working the levels on our milling machines. Congratulations Greg we look forward to celebrating your next milestone in 5 years. December sees us celebrating 2 milestones in Qld. Bill Stirling has celebrated his 10 year anniversary working for Base Course Management Qld and Linda Lacey celebrating 5 years. Bill joins Terry Pearce as 2 of our most experienced operators with over 10 years each with us. Linda is our Qld Office Administrator and joined our team in 2008. Both Linda and Bill were presented with their anniversary plaques buy the General Manager Steve Gawley. Congratulations guys, we look forward to many more years together. Our brand new Wirtgen W200′s are here. 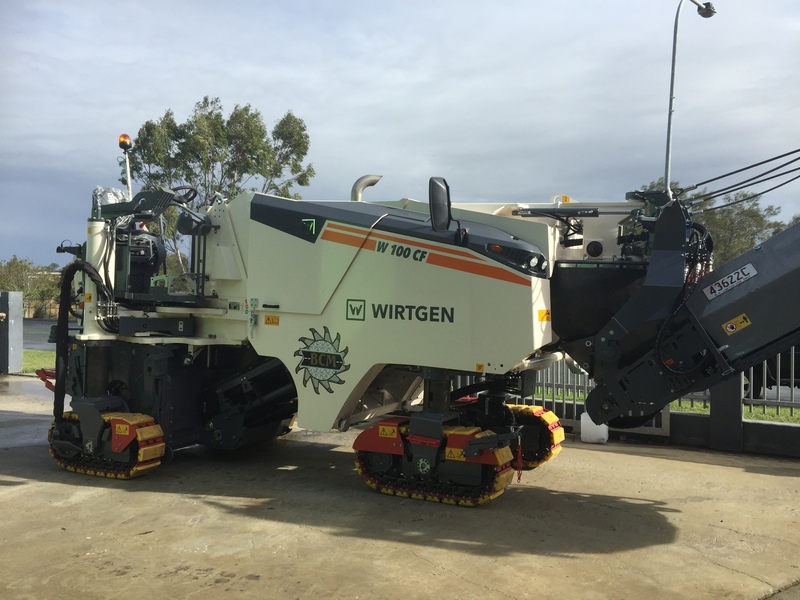 Both New South Wales and Queensland have taken delivery of brand new Wirtgen W200 Milling Machines. The latest W200 arrived into QLD mid August 2012. The W200 has all the safety features and milling capacities as the W210, but with slightly less horse power it makes it an ideal machine for milling conditions where the high horse power of the W210 is not required, offering our customers the most cost effective solution to their milling job. New W210 Fleet Has Arrived! May 2010 saw the arrival of the much anticipated upgrade in Wirtgen Milling Machines with delivery of the first of six brand new W210 milling machines. Base Course Management Qld was the first milling contractor and for sometime the only milling contractor in Queensland with a W210 in its fleet. With a multitude of changes compared to previous models our operators needed to be retrained by Wirtgen technicians to operate this machine in its most efficient mode. With 2 engines, 3 drum speed settings, fewer operator controls, dust extraction system, and lighter operating weight the new W210 now performs quicker, safer and more efficiently than any of its competitors. Jobs already credited to the W210 in Queensland include the Bruce Highway Upgrade at Bli Bli for Downer Edi Works, Bruce Highway Service Road Upgrade at Burpengary for Allens Asphalt, Gateway Arterial Upgrade at Eagle Farm for Leighton-Abi Group Joint Venture, Ann Street Brisbane for Brisbane City Council, Gateway Upgrade Murarrie for Fulton Hogan, Gateway Upgrade at Eagle Farm for Boral Asphalt as well as many other smaller projects. The W210 is an ideal machine for work in inner city conditions and other applications where dust needs to be minimal. With the dust extraction system you can see in the pictures above that dust is not an issue for the operators or the environment around the machine. CCTV cameras on the front and rear of the machine enable the operator to clearly see around the machine before moving forward or backward providing a much safer working environment for all workers around the machine. Other new features include the ability to mill up against concrete kerb to a maximum depth of 330mm. New multi-pro sensor systems enable for the most accurate depth settings of all milling machines currently available. A fine milling drum can be fitted to the W210 in a short amount of time allowing a quick turn-around from fine milling to deep cut milling. Base Course Management’s fleet of new Wirgten W210’s is the most efficient, powerful and environmentally friendly Road Profiling machines in Australia.